December 6, 2018 Dan O. Hey, at least we have a pope! When he was elected to become the next Pope, Jorge Mario Bergoglio made it his absolute mission to heal the world of all its obvious problems. So, he became Pope Francis and began to take on the world-at-large, one huge issue at a time. Which means that when he’s talking about climate-change being real, or homosexual couples being respected and treated as equals, or calling out the rich for not doing what they can to help out the poor, or going to war-torn countries, or speaking out against the lack of civil rights in some countries, or having an issue with the Catholic church defending sexual-predators, it obviously ruffles a few feathers. But he knows what he was put on this planet to do and he’s not going to stop doing it until he is called up into the heavens. And at this rate, who knows when that will actually happen. It should be pointed-out immediately that you don’t have to be a Catholic to appreciate Pope Francis, the movie, as well as the man. All you have to do is take note of the things he is saying, the actual things he is doing, and who he stands for as a person; all of that talk about God, Catholicism, and whether or not one should have faith, doesn’t really matter here, because it’s not that kind of a documentary. 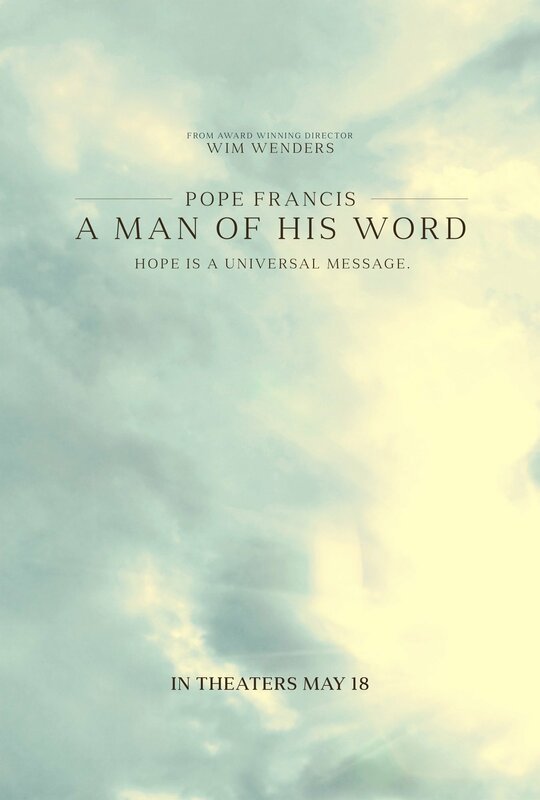 Director Wim Wenders make its clear from the start that he’s mostly interested in the issues that Pope Francis is choosing to speak-out against and how he’s doing everything in his power and might to not only remind people of the problems within today’s world, but to also love and respect one another while remembering. It also helps that he does everything with a clear passion, a warm touch, and a smile on his face, almost always. Regardless of what it is that he represents in Catholicism, it’s hard not to be amazed by a person who can walk into any room in the world and have literally everyone in said room going nuts. It’s also hard not to be touched by a person who walks into the most dangerous and sometimes depressing rooms in the world and genuinely care and love for those in said room. Once again, it’s not what he represents, it’s what he is and it’s why A Man of His Word works as well as it does. Never wash that forehead again. Ever. And it’s why it may also be a nice companion-piece alongside First Reformed, oddly enough. Both are movies about men involved with the church, trying to grapple with their faith, understand what it is that they can to make the world a better place, and also the guilt they feel from not being able to do enough. In the case of both protagonists, neither of them can really do much about climate-change or human-rights, except that they can help spread awareness and be the beacon of good nature, hope, and peace that hot-button and controversial topics sometimes need. However, while First Reformed was about a fictional person, A Man of His Word is most definitely about a real person, who will do everything in his might to ensure that his position of power is used for the greater good of the world. Catholic or not, Pope Francis is a genuinely kind-hearted soul and in a world that’s rapidly changing and making it harder to find such peaceful beings, it’s nice to be reminded that those specimens do exist and hold a lot of sway over a huge percentage of the world’s population. It’s dangerous, for sure. But in the hands of Pope Francis, I think we’re safe. Consensus: Whether a firm believer in the faith or not, A Man of His Word works best as a heartfelt, passionate, and complex study a man who is doing the right thing for our world and is never going to stop until the day he dies.